Let us say it now and repeat it as often as possible. The proffered "Roadmap to Peace" between the Palestinian Authority (PA) and the nation of Israel is dead on arrival. 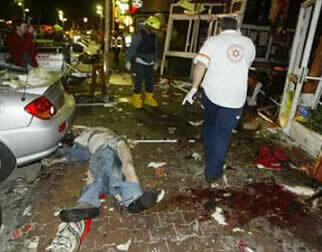 It died along with the victims of a suicide bombing in Tel Aviv the same day the PA was proclaiming that a new Prime Minister, Mahmoud Abbas, had been elected. There is only one PA authority and that is Yassir Arafat. Until he is dead or deposed entirely, there is no hope for peace. Abbas has been Arafat's right-hand man for decades. Nothing has changed and nothing will until the PA ends its reliance on terrorism and that is not going to happen. Americans cannot grasp the depth of the hatred for Israel that is shared by the Palestinians and Arabs throughout the Middle East. It is irrational and it is based in the religion of Islam. The day following the bombing I received a "Founding Declaration" of the "Global Campaign for Resisting Aggression" headquartered in Mecca, Saudi Arabia. It arrived as plans for withdrawing American troops from that nation were reported. "The Muslim Ummah (worldwide community) has been subjected to vicious aggression at the hands of the forces of tyranny and oppression, especially the Zionists and the American administration led by right-wing extremist, that are working to expand their control over nations and people, loot their resources, to destroy their will, and to change their educational curricula and social system." The Declaration went on to say that "One of the worst forms it (the aggression) has taken has been armed attacks on peaceful countries and people such as the American and British invasions we have seen in Iraq and Afghanistan…" Afghanistan was home to Osama bin Ladin's Taliban prior to 9-11. Its citizens were subject to the brutal oppression of the Saudi Arabian followers of bin Ladin who had taken over that nation. Iraq's history as a peaceful nation included an eight-year war with Iran and the invasion of Kuwait, both Islamic nations. "This is besides," said the Declaration, "what the Zionist are doing through occupying Palestine, expelling unbending people infringing their rights, and defiling Islamic holy places." There is no Palestine. Those that call themselves Palestinians have a long record of defiling both Jewish and Christian holy places. The United States has put its military in harm's way to protect Muslims in Bosnia and Serbia, bring humanitarian aid to Somalia, and liberate the Kuwaitis, Afghanis and Iraqis. All Muslims. Our embassies in Lebanon, Kenya and Tanzania have been bombed by way of a thank you. In 1979, in Iran our diplomats were taken hostage and held for 444 days. The Declaration announced its goals to be (1) "To work to alert the Ummah concerning the plans of its enemies, calling on the community to protect its identity. (2) To repel the aggression of our enemies with all possible legitimate means. (3) To reawaken the Islamic spirit among Muslims to serve their Faith and nation, and to defend their rights. (4) To clarify the true image of Islam, to explain the humanitarian and ethical aspects of its laws, and to expose the falsehood of the campaigns of prejudice against Islam." There are a few more goals, but when it comes to aggression, Muslims have shown themselves to be the primary perpetrators around the world in Russia, in Africa, on Bali, in the Philippines, in India, in Saudi Arabia, and, of course, against the United States. Meanwhile, in the United Nations, the current chair of its Commission on Human Rights is held by Libya. Three other state sponsors of terrorism are members, Syria, Sudan and Cuba. On April 15, the Commission adopted a resolution sanctioning the use of "all available means including armed struggle" as legitimate acts of aggression against Israel. Over the past thirty years, more than twenty-five percent of all resolutions passed by the Commission have been directed at Israel. As professor Anne Bayefsky, a member of UN Watch board of directors, correctly noted in a recent Wall Street Journal opinion editorial, "Commission meetings themselves are a platform for incitement to hate and violence." At this point in time, a Saudi Arabian-based "Global Campaign for Resisting Aggression" is calling for continued aggression against the United States, Great Britain, and Israel, and the UN Commission is echoing their message. Anyone who says that Islam is not waging a global war of terrorism is refusing to look at the facts on the ground. This is, by any definition, an Islamic holy war. The United States has responded by seeking to liberate two Islamic nations from their oppressors and warning others against this course of action. It has made it clear it will not tolerate terrorism on its soil and it will go anywhere in the world to thwart and end it. Israel is the US and the West's surrogate in the Middle East. It is hated because it is not Muslim. Until the Muslim Ummah collectively decides to forego aggression, there will be no peace in Israel, nor anywhere else on the face of the globe. That is not likely to happen soon. Do not expect the US to abandon Israel and do not expect the US to remove its troops from the Middle East for a very long time to come. Winston Churchill once said of the Germans, "They are either at your throat or at your feet." That is our choice in the Middle East. If we must fight this enemy, let's do it in their backyard.